From one-day bath or shower installations to accessory updates or full remodels, Five Star Bath Solutions is your complete bathroom renovation solution. 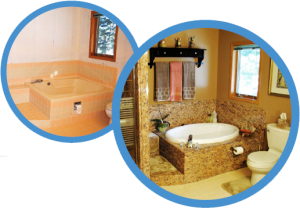 As the bathroom renovation experts, we are committed to fulfilling your bathroom renovation project with professionalism, quality, and timeliness. We recognize that bathrooms come in all shapes and sizes and will work with you to provide the desired bathroom enhancements. Update your bath or shower in as little as one day with Five Star Bath Solutions. From corner showers and wall systems to new bathtubs and full size showers, remodel your bathroom with new style or greater functionality, while increasing the value of your home. Transform your bathing space into a new walk-in shower. Whether you rarely use your bathtub, or are looking for increased accessibility, Five Star Bath Solutions can convert your bathing space into an easy access walk-in shower. Great for seniors or those with limited mobility, walk-in bathtubs provide a balance of comfort, safety and functionality. Equipped with a safety grab bar, hand-held shower, safety seat and ‘arthritis friendly’ faucet handles, a walk-in bathtub can create a safe bathing solution, without compromising bathing independence. *Add-on services vary by location.